Once upon a time, in an old village in Western Japan, there lived an old samurai named Tada Shusaku. He was strong and kind, and he protected the village from danger. Early every morning, he could be found in his garden practicing his fighting skills with a wooden sword. As old as he was, he was still quick and powerful. He was very fond of reading, and could often be found reading old books. Tada Shusaku was once a great swordsman. Before, he had taught some of the most powerful nobles in Kyoto. Now, he led a simple life and seldom went to the city. From time to time, young samurai from Kyoto would stop by the village and beg Shusaku to teach them. These samurai were surprised to find Shusaku working in the rice fields with the villagers. 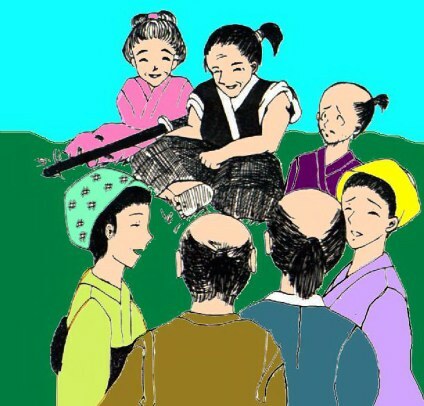 They were absolutely mortified when they saw the old samurai talking and laughing with the commoners as though they were his equals. Many of these samurai believed that farmers and peasants were beneath them. Shusaku disagreed with them. He believed that the young samurai lacked humility. So, he would not teach them. Tada Shusaku had a young daughter named Sayuri. Sayuri was kind to everyone, and could make even the grumpiest old men laugh and smile. So pure was her heart that even wild animals would let her feed them. Men had come from far and wide to beg for Shusaku for her hand in marriage. Rich and poor alike he always told them sternly, “She's not ready yet" Still, many would return to ask again. Some people wondered if Shusaku would ever let Sayuri get married, for they knew that he loved his daughter more than life. It would break his heart if she ever left him. Some nights Sayuri would play her bamboo flute and all the people in the village would gather to listen to her. She loved to dance. Sometimes she would sneak away from the village and play in the river with her friends. The river was her favorite place, and she would spend many hours in the summer wading in its cool waters. The village was peaceful and prosperous. The people were happy. But, there was trouble in the capital. People passing through the village brought news of a war that was spreading throughout Japan, a war that would soon change the lives of everyone in the village. In the summer the days were long and uncomfortably hot. The air was so thick with moisture that even the smallest chores were exhausting. The villagers began their work earlier than usual, for the deadly heat of midday made work all but impossible. They were forever soaked in sweat and many villagers became sick. Even night brought little respite from the heat. One day, Sayuri woke up well before dawn as she sometimes did. She hurried to the river so that she could watch the sun rise above the distant mountains. She did not mind the coolness of the morning dew on her feet as she ran. She felt so free and happy. She quickly ran through the forest and up a small hill overlooking the river. When she got to the top of the hill the sun was just peeking over the mountains. She stopped and stood in awe as the sky turned bright orange. Though she had seen the sunrise many times, the beauty of it always captivated her. But, something felt wrong this morning. Rather than feel a sense of joy and calm as she usually did when she came to the river�C Sayuri felt something different. She felt like someone was watching her. She felt the hairs on her neck prick up and she had the sudden urge to run away. For the first time in her life, she was terrified. Suddenly someone burst from the trees and ran towards Sayuri. It was an old woman. Her face was covered in blood and her cloth kimono was torn and dirty. The old woman tripped on a rock and fell to the ground. She lay there, on her stomach, motionless. Her face was turned towards Sayuri. Her eyes looked crazed with fear. “Help me,�Eshe whispered again and again. Sayuri wanted to help the woman, but she was too scared to move. She just stood there and started to cry softly. Sayuri heard a twig snap behind her and she turned around quickly. There were two men there. The men looked young. They were both covered in dirt and grime and smelled of spirits. Both were carrying dangerous looking axes. One of the men smiled at her toothlessly as they started walking towards her. Tada Shusaku and the villagers share a light moment.